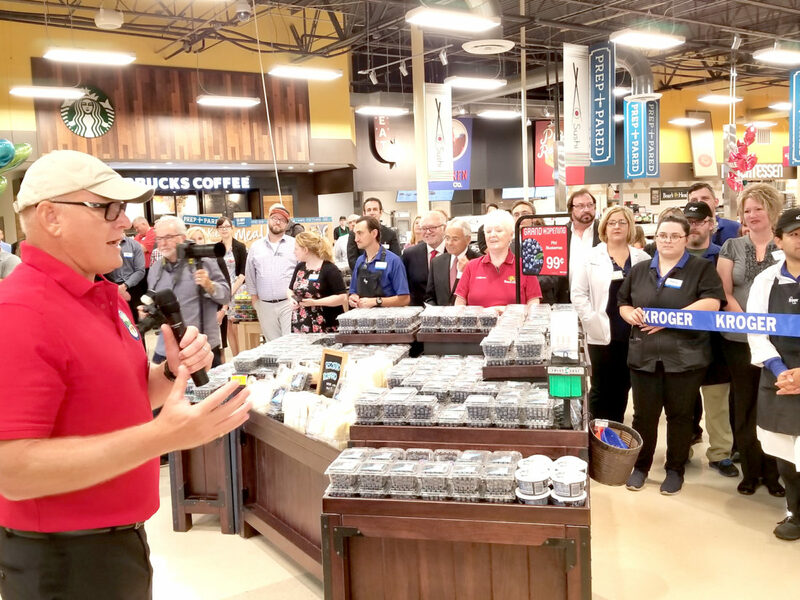 STEUBENVILLE — A new look and new products and services were unveiled at Kroger in the Hollywood City Center Wednesday as an open house was held to mark the conclusion of a nearly $4.2 million store update. New features in the 82,508-square-foot store include a Starbucks and seating area. There is a Murray’s Cheese Shop. A culinary kiosk added to the deli offers a selection of made-to-order gourmet pizzas through Pizza Romana, while the Chicken Co. offers made-to-order chicken meals and a la carte choices. Shoppers also will discover Prep+Pared Meal Kits, a wider sushi selection and new organics and natural foods among the store aisles. Cutting the ribbon was 42-year Kroger employee Bo Brown. State Sen. Frank Hoagland, R-Mingo Junction, said the Hollywood Kroger store was among his first stops when he returned from an overseas tour of duty as a Navy SEAL. People should recognize what we have in America, Hoagland said. Mayor Jerry Barilla congratulated Kroger and Dominic Teramana, whose family’s Teramana Enterprises developed the Hollywood shopping plaza in the early 1960s and continues to own and operate it. Kroger was at the center from the beginning. “It’s through his leadership that Hollywood City Center is successful and remains a huge asset for the city,” Barilla said. “This is a special day for the citizens of Steubenville and surrounding areas. Kroger has long been a staple in our community, providing the food of life and products that support our health and well-being,” Barilla said. He said the renovations are indicative of Kroger keeping up with changing times and the wants and needs of shoppers. John Minea, Kroger vice president of merchandising, noted the store didn’t gain square footage during the remodel but feels bigger, thanks to the open-beam ceiling and changes in lighting in parts of the store. He also thanked Teramana. He noted the plan was to have the store completed by mid-summer, and he congratulated the 190 store associates for their efforts during construction and customers for their patience. Minea noted the presence of Scan, Bag and Go, a system that allows customers to use a wireless handheld scanner or a mobile app to scan and bag their items as they shop. Click-List allows shoppers to select items online and pick them up curbside. Store manager Rob Siudak is a 29-year Kroger veteran who started working when Kroger was where the TJ Maxx store is now in the Hollywood City Center. Teramana said Kroger has a good relationship with the center going back to the original 33,000-square-foot store. 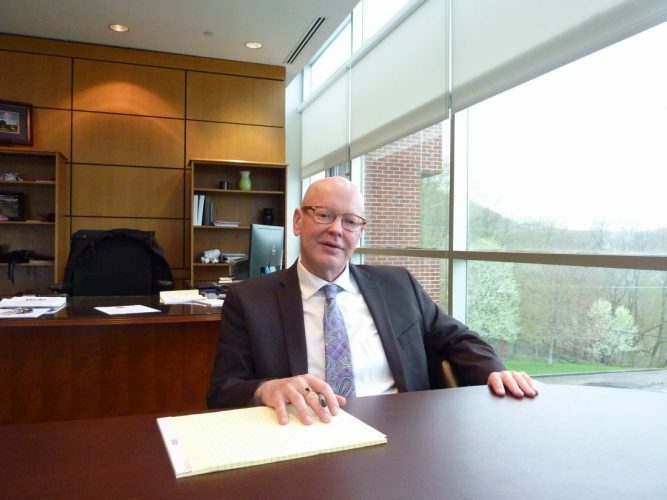 “I became close to the real estate manager of Kroger for years and years, Bill Hoffman, a wonderful guy. The Kroger store was always one of the top three stores in the division,” Teramana said. He said Kroger could have had 62,000 square feet by moving into the former Kmart space, but wanted nearly 84,000 square feet, so the building was torn down and a new store was built. Teramana said it was then that the center changed its facade, added a clock tower and eventually got TJ Maxx to move into the former Kroger space. “You never stay the same in the real estate business or any business. If you’re not changing, you’re not getting better. You’re going backward. We strive to keep improving things here and we are so happy that Kroger felt the same way about the center and invested all this money in the store,” Teramana said. Councilwoman at large Kimberly Hahn said after the ceremonies that the curbside pickup can help fill a need for residents who live downtown, where there is no grocery store. “People can order their groceries and share rides to come pick up their groceries. It can meet more of the needs of people downtown while we work to get a grocery store to come back there,” she said.